Windows 10 build 16241 brings a series of new features and improvements to the table, including Windows Shell improvements, PC gaming and Task Manager improvements, Mixed Reality fixes, and more. As expected, build 16241 also brings issues of its own. 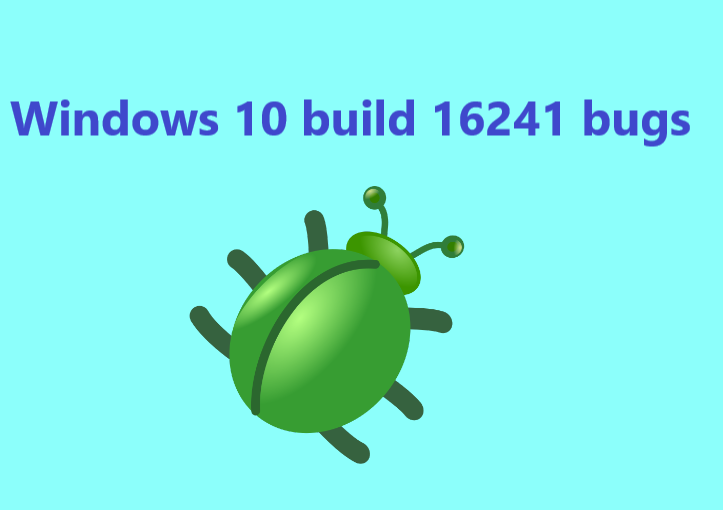 In this article, we’re going to list the most common build 16241 bugs reported by Insiders, as well as their corresponding workarounds whenever available. Many Insiders are still struggling to install build 16241 on their devices. The install process often gets stuck, freezes or fails with various error codes. Updates downloaded the 16241 build and I restarted the machine, went into the update process and has been stuck on 33% for the last 6 hours. Never had this happen before. Insiders report that Action Center is unresponsive on the Surface Pro 4 due to scaling issues. More specifically, Action Center detects the wrong mouse pointer coordinates. As a quick workaround, you can change the DPI scaling values and see which values work best for you. When I point at a spot in action center […], the Action Center actually behaves as if my mouse pointer is about half the screen height further down below […]. If I set my Surface Pro 4 to 100% DPI scaling instead of 200%, the action center works fine. And sometimes it will be okay even after putting it back to 200% (which is default and really the only way to read the screen for me). But something in this build with DPI scaling has seriously jacked up mouse tracking. Insiders report that many apps fail to work properly after installing build 16241. For example, the Movies & TV app and WMP fail to play videos, while audio is available. After upgrading to Windows 10 Insider preview Build 16241 from 16237 , I’m having issues with Movies & TV app and WMP. The issue is when I play a normal MP4 video file, the default Movies & TV app shows a green background and I can hear only the audio. While WMP shows black background and plays only the audio. Other users report that they can’t launch Edge and Skype. Bluetooth is not working in the latest Windows 10 builds, and build 16241 is no exception. Insiders noticed that this issue affects mainly CSR chipsets. To fix this problem while still remaining enrolled in theWindows Insider Program, buy a new USB Bluetooth dongle that uses a different chipset. When you connect the new dongle, Windows should install a series of new drivers, and you’ll have functioning Bluetooth again. If your machine has a built-in Bluetooth radio, try disabling it in the BIOS/UEFI to prevent Windows from trying to make it work. These are the most frequent Windows 10 build 16241 bugs reported by Insiders. As you can see, this build is pretty stable and is not affected by severe issues such as system freezes, crashes or BSoD issues.